The use of mobile technologies to enhance 21st century learning is increasing in K-12 schools and teacher education institutions. Thus, there is a need to effectively prepare preservice teachers to use mobile technologies in their future classrooms. This chapter explores the effective use of mobile technologies in teacher preparation in ways that are transferred to K-12 teaching and learning. It goes on to look at two major organizations: the university and partner school involved in the preparation of preservice teachers. Additionally, the purposes of incorporating information and communication technologies in teacher preparation as identified by Davis are explored to understand how mobile technologies align with these purposes. Common challenges of using mobile technologies in teacher preparation are also presented. The use of mobile technologies is changing educational landscapes. Accordingly, K-12 schools and teacher education institutions are using mobile technologies to enhance their practices and meet the needs of 21st century learners. This is due to the increasingly ubiquitous and pervasive nature afforded by mobile technologies that has resulted in teacher education and K-12 classrooms where bring your own device (BYOD) plays a significant role (e.g. Crompton, Burke & Gregory, 2017; Burns-Sardone, 2014). In view of this, preparing preservice teachers (PTs) for K-12 classrooms where BYOD flourishes is an important practice and it also provides additional opportunities to increase the flexibility of teacher preparation. In this chapter PTs refer to student teachers being prepared to gain qualified teaching status in primary or secondary schools upon graduating from their program. 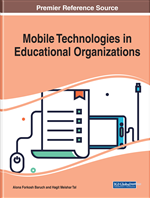 This chapter presents examples of empirical findings and teaching practices across the globe to provide a background on how mobile technologies are used to further prepare PTs for their future classrooms and the digital world as well. First, it identifies PTs’ multiple learning contexts which have been enhanced by mobile technologies. This is followed by a summary of existing literature about preparing PTs to use mobile technologies in educationally effective ways. In particular, two major organizations involved in the preparation of PTs are presented. These are initial teacher education (ITE) programs where PTs take their university-based courses and K-12 schools (partner schools) where PTs gain field experiences. Given the fact that ITE takes place in universities and colleges as well as in partner schools, m-learning would appear to be a natural fit with numerous pedagogical affordances assuming there is infrastructure that support the use of mobile technologies. The next section presents case studies identified in the literature review focusing on how mobile technologies have fostered pedagogical innovations in teacher preparation. In addition, the chapter discusses different ways mobile technologies have enhanced delivery and accessibility of electronic learning materials especially for distance learning PTs who are separated by time and place. This chapter ends by identifying common challenges of using mobile technologies, and future research directions in teacher preparation. Presenting a comprehensive and contemporary body of knowledge regarding this topic, will increase our understanding about how teacher preparation programs are responding to the call of effectively preparing PTs to use mobile technologies to support K-12 students’ learning (U.S. Department of Education, Office of Educational Technology, 2017). Preservice Teacher: A student teacher studying in either a public or private ITE institute to gain qualified teaching status in primary school or secondary school upon graduating from their program. Bring Your Own Device (BYOD): A term used to encourage learners to bring their personal mobile devices to the classroom for learning purposes. Teacher Educator: An instructor at the institute of higher education who teaches PTs. Partner School: K-12 school where PTs gain their field experience by being mentored by experienced teachers based on the agreement with the university. Mobile Learning: The process of acquiring knowledge and skill by being taught, studying, and practicing inside and outside the classroom using mobile technologies. Mentor Teacher: An experienced teacher who supports PTs by coaching, providing feedback, and allowing them to reflect on their practices during their field experience. School-Based Practicum: A period when PTs get an opportunity to practice teaching.